Slender, with an elongated handle, this coin silver cream ladle measures 6 1/2" overall and weighs .9 T. oz. It has an oval bowl that is 1 7/8" wide, 1 1/2" back to front, and 1/2" deep. A "Tipt" pattern, it is stamped "Boynton & Woodford," for the Boston jeweler and "comb maker" with dates 1837-54. There is a large script "S.A.B." monogram on the backside of the handle. Subsequent to a partnership with Julius Hollister that existed about 1843-46, Oliver D. Seymour operated his own shop in Hartford, Connecticut until at least 1852 (Dorothy Rainwater Encyclopedia of American Silver Manufacturers). This 8 11/16" long, 1.5 T. 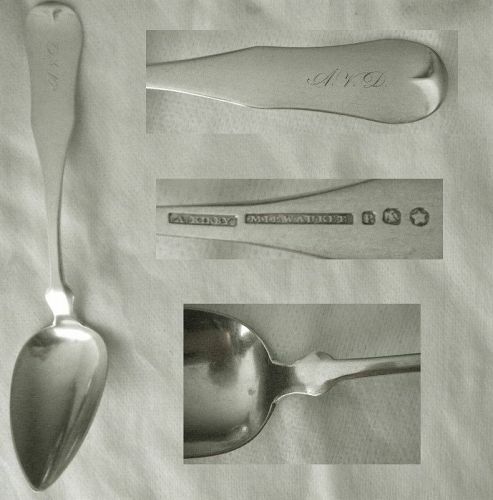 oz., coin silver tablespoon carries his name along with an "eagle" and "star" hallmarks that William McGrew in his work on marks identifies with Hartford. Measuring 5 7/8" long, and weighing 3.1 T. oz. 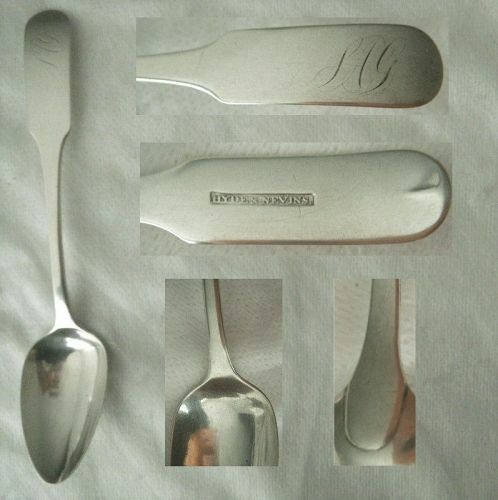 the group, these six teaspoons all match and all have the same script "D" monogram engraved sideways on the handle fronts. A "Tipt" or "Fiddle Tipt" design they are very early examples of the work of William B. Durgin, whose name appears on the backside of each one. He founded his company in 1853 and these date about that time. The mark on this 8" long, 1.2 T. oz., master butter knife is "D. Kinsey," for David, who along with his brother Edward were major silver manufacturers in 19th century Cincinnati, both singly and in partnership. 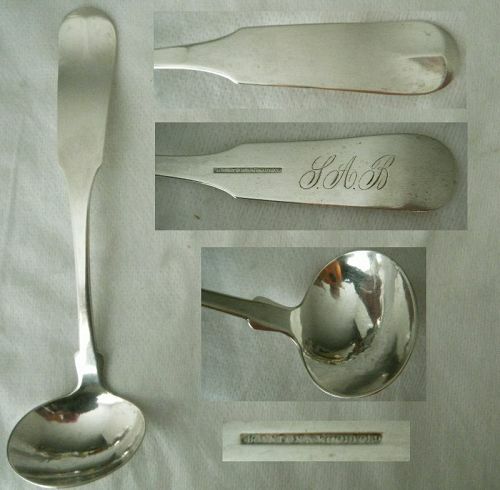 Cincinnati Silver 1788-1940 indicates that David operated alone following Edward's death in 1861, and himself died in 1874, dating this to that time span. While a holder of a number of widely embraced, older, flatware design patents, and a substantial manufacturer, pieces that actually carry any of Michael Gibney's marks are not particularly common. This large at 10 1/4" long, and weighty at 3.4 T. oz., fish server is one of those examples that is stamped with his three part "oval, circle, diamond" emblem, with (a rubbed) "MG" in the upper portion and the date "1845" within the diamond.